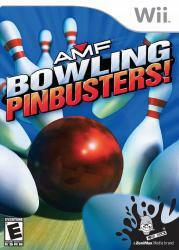 VainSoftGames | AMF Bowling Pinbusters! Take on the challenge alone in one of the various single-player modes or strike up competition with your friends in multiplayer mode. Bowl Now allows for instant action! No bowling shoes required. Tournament Mode offers league bowling for serious competition. Practice Mode allows you to refine your technique and offers exciting mini games that are both challenging and entertaining.